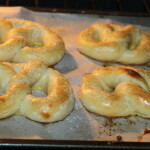 Soft Pretzel Recipe – Classic Home Made Style! The past couple of weeks of winter have made me long for summer again. Just thinking about the hot sun, gardening, baseball games and more was enough to make me happy. We have had several days of below zero temperatures, frigid winds and school closings, along with the gray and gloomy skies. We cherish most days of winter and see it as a time to regenerate our body, mind, and gain the energy that will be required for summertime projects. Nice golden color on the outside doesn’t require the use of lye. 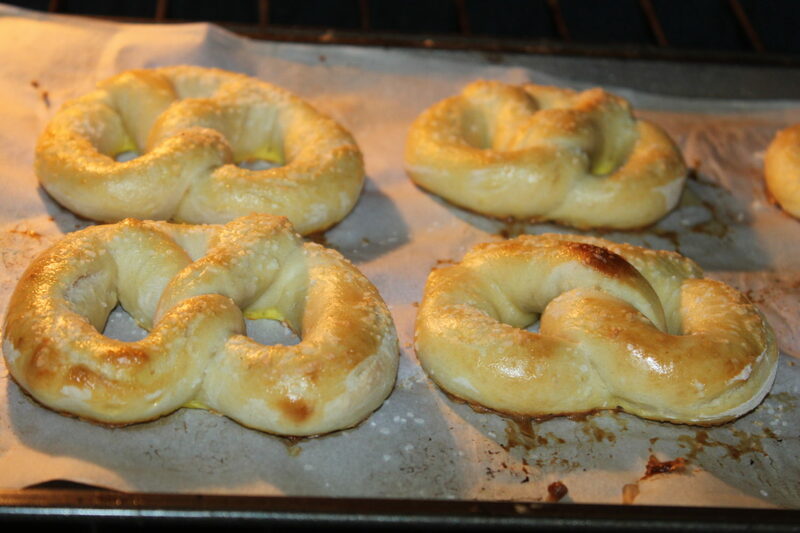 So this past Sunday afternoon, we decided to “Think Summer” and make Homemade Soft Pretzels! With 4 active teenagers, Jim and I have spent a countless hours, days and even weeks at the ball park. When you spend that much time at various ball fields, you can’t help at some point to break down and buy a hot soft pretzel – so what better way to think summer than baseball fields and soft pretzels! 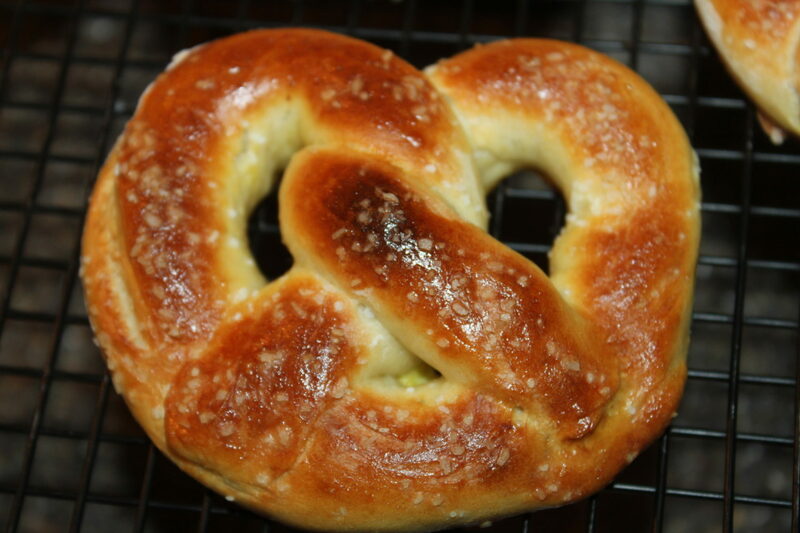 Many people will tell you that you have to use lye to make the perfect soft pretzel. I beg to differ. I prefer to put as little chemicals into my food as possible, and although this may not be an exact replica of the ball park soft pretzel – there are never any leftovers! So here is to looking forward to those hot summer days with this soft pretzel recipe, and no, we promise not to complain how hot it gets this summer! 1. Line baking sheet with parchment paper and set aside. 2. Dissolve yeast in lukewarm water. *You do not have to measure the temperature. Stir with a spoon until mixed – takes about 1 minute. You may have some small clusters of yeast that remains. Knead dough for 3 minutes on a floured surface. 3. Add salt and sugar; stir until combined. 4. Slowly add 3 cups of flour, 1 cup at a time. Mix with a wooden spoon until dough is thick. Cut about 1/3 cup of dough from your ball to make each pretzel. 5. Add 3/4 cup more flour until the dough is no longer sticky. If it is still sticky continue to add up to 1/2 cup more. 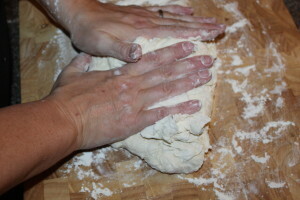 ** Hint – if you poke the dough with your finger and it bounces back, it is ready to knead. 6. Turn the dough out onto a floured surface. Knead the dough for about 3 minutes and shape into a ball. 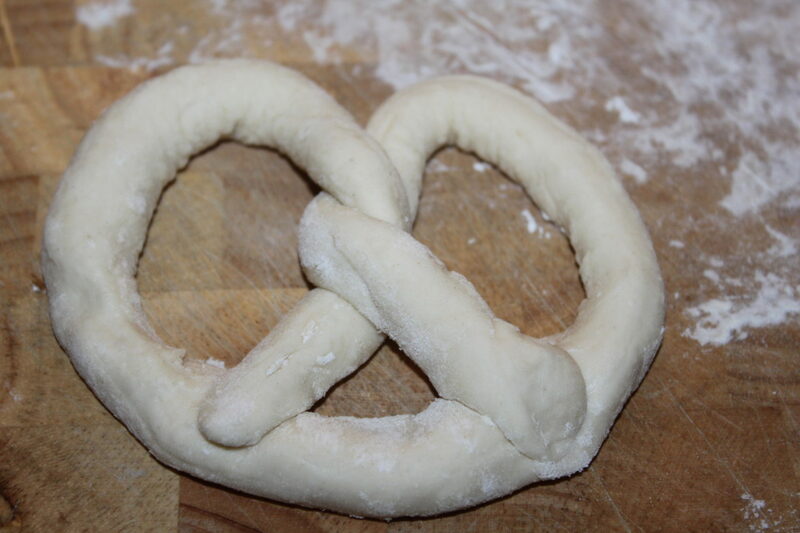 Roll out dough – approximately 20 inches in length then begin to shape into a pretzel shape. 7. With a sharp knife, cut the dough into approximately 1/3 cup sections. **This measurement does not have to be exact – use however much dough you would like depending on the size of the pretzel that you desire. 8. Roll the dough into a rope with an even diameter. Roll to your desired length. (We rolled the dough to about 20 inches in length). 9. 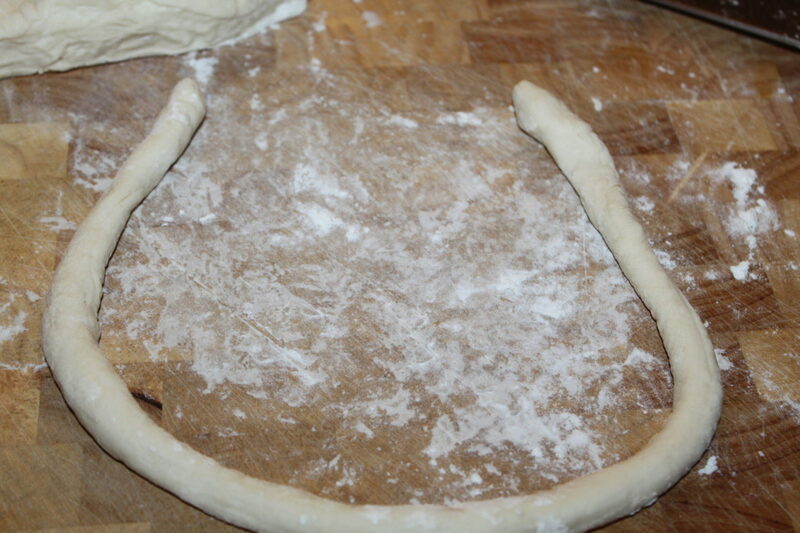 Form the pretzel -Take the ends of the rope and draw them together so the dough forms a U. Cross the ends over each other about an inch from the ends, then twist them over each other. Then bring the ends towards yourself and press them down into a pretzel shape. 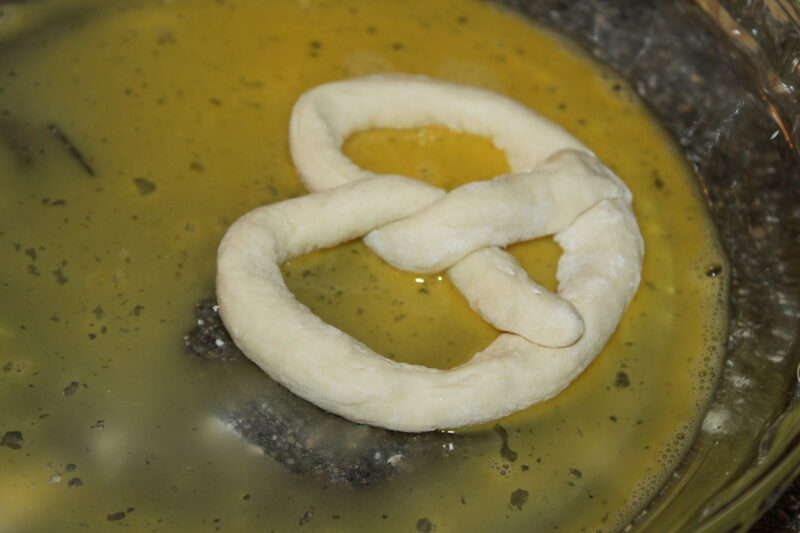 Pretzel formed and ready for the egg wash.
*Optional: You can boil 9 cups of water with 2/3 cup of baking soda. Dunk the pretzels one by one into the mixture for 30 seconds. This will give you that dark exterior and texture of traditional pretzels. Again, it’s not necessary and we did not do it for these pretzels. Dip both sides in egg wash and apply salt before baking. 10. In a pie dish beat the egg with a whisk. Dunk the shaped pretzel into the egg wash (both sides). Place on baking sheet and sprinkle with salt. **Another option would be to coat with butter and sprinkle with cinnamon sugar for a sweet version of this recipe. 11. Bake for 10 minutes at 425 degrees F.
Pretzels will rise in the oven when baking – and brown when placed under the broiler. 12. Turn the oven to broil and bake for 5 more minutes to brown the tops. Watch closely to avoid burning. ** Skip this step if you dunked the pretzel in the baking soda bath. Serve warm or at room temperature. Pretzels may be stored in an airtight container for 3 days – to prevent losing softness, add a piece of bread to your container. Pretzels will also freeze well. Dissolve yeast in lukewarm water. *You do not have to measure the temperature. Stir with a spoon until mixed - takes about 1 minute. You may have some small clusters of yeast that remains. Add salt and sugar; stir until combined. Slowly add 3 cups of flour, 1 cup at a time. Mix with a wooden spoon until dough is thick. Add 3/4 cup more flour until the dough is no longer sticky. If it is still sticky continue to add up to 1/2 cup more. 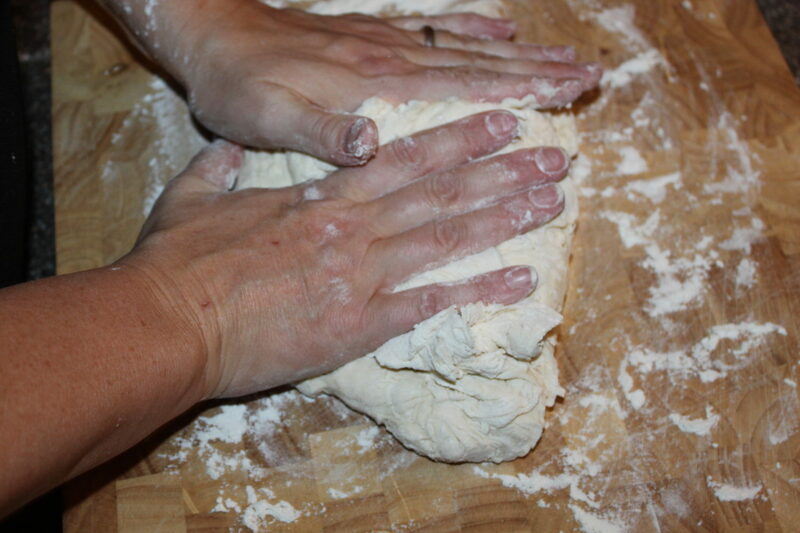 ** Hint - if you poke the dough with your finger and it bounces back, it is ready to knead. Turn the dough out onto a floured surface. Knead the dough for about 3 minutes and shape into a ball. 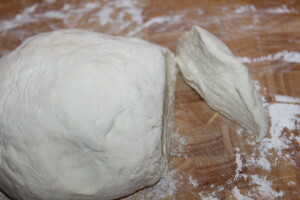 With a sharp knife, cut the dough into approximately 1/3 cup sections. **This measurement does not have to be exact - use however much dough you would like depending on the size of the pretzel that you desire. Roll the dough into a rope with an even diameter. Roll to your desired length. (We rolled the dough to about 20 inches in length). Form the pretzel -Take the ends of the rope and draw them together so the dough forms a U. Cross the ends over each other about an inch from the ends, then twist them over each other. Then bring the ends towards yourself and press them down into a pretzel shape. Optional: You can boil 9 cups of water with 2/3 cup of baking soda. Dunk the pretzels one by one into the mixture for 30 seconds. This will give you that dark exterior and texture of traditional pretzels. Again, it's not necessary and we did not do it for these pretzels. In a pie dish beat the egg with a whisk. Dunk the shaped pretzel into the egg wash (both sides). Place on baking sheet and sprinkle with salt. **Another option would be to coat with butter and sprinkle with cinnamon sugar for a sweet version of this recipe. Bake for 10 minutes at 425 degrees F.
Turn the oven to broil and bake for 5 more minutes to brown the tops. Watch closely to avoid burning. ** Skip this step if you dunked the pretzel in the baking soda bath. Serve warm or at room temperature. Pretzels may be stored in an airtight container for 3 days - to prevent losing softness, add a piece of bread to your container. Pretzels will also freeze well.